It’s difficult to find a good comparison of puzzle brands on the web. We hope you find this useful! Scroll down for links to each brand’s detail page. Ravensbuger –– High quality thick and sturdy packaging and puzzle pieces. Standard grid type puzzle. Wide range of images. Jumbo –– High quality thick and sturdy packaging and puzzle pieces. Standard grid type puzzle. Publishes JVH and Wasgij. Falcon — High quality thick and sturdy packaging and puzzle pieces. Standard grid type puzzle. Tends to cozy UK images. Heye — Good quality boxes. Standard grid type puzzle with a wide variety of shapes. Best cartoon puzzles. Piatnik — Good quality with thick pieces and a snug fit. Standard grid cut. Fine art, cartoon, and photo collage puzzles. Schmidt — High quality packaging and puzzle pieces. Quirky grid cut with lots of variety. Excellent fantasy puzzles. Clementoni — Solid quality with thick pieces and a linen finish. Standard grid cut. Conventional images. Anatolian — Solid quality with thick pieces and nice boxes. Standard grid cut. Conventional licensed images. D-Toys (editions with “wide variety of shapes” sticker) –– Standard grid cut puzzle with six piece shapes. Offers unique cartoon, folk art (“classic tales”), and fine art puzzles. Gibson — Lovely boxes, thick pieces with a waxy feel. Overall stellar quality. Grid cut pieces. Pieces can appear to fit where they do not. House of Puzzles — Best unusual piece cut and images created for puzzling with lots of colors and textures. WHSmith — Similar to Gibson, good boxes and sturdy puzzle pieces in a grid cut. Pieces can appear to fit where they do not. Otter House – Nice smaller boxes, good overall quality on the pieces. Hard to get outside UK. Cobble Hill — ‘Linen finish’ boxes and puzzle pieces have a nice feel. Pieces are thick. Random cut. Eurographics — Pieces are thick. Not quite grid cut with a wide variety of piece shapes. Large image selection. Some puzzle dust and glare. Bits and Pieces — Thick pieces with a non-grid cut. Best shaped puzzles in the industry. Lafayette Puzzle Company — Grid cut puzzle with a seamless fit, sturdy and attractive boxes and pieces. Pomegranate — Fine art puzzles with excellent quality. Sunsout— Unattractive boxes but good puzzles. Thick pieces with a non-grid cut. Tight fit. Tons of images. Springbok — Thick puzzle pieces, a super tight fit, unusual piece shapes and good colors. Images are so-so. Lots of photo puzzles. Vermont Christmas Company — Fairly thick puzzle pieces, a semi-random cut with a good variety of shapes, overall nice quality and lots of unique Christmas and Halloween images. White Mountain — Great image selection and regular releases. Larger pieces with a nice random cut. Pieces are on the thin side, with occasional image lift and some puzzle dust. Puzzlelife — Puzzles come with a large poster and glue and are of good quality. Most reasonably priced of the Asian puzzle brands. Yanoman — Thick pieces with a grid cut similar to Ravensburger. Excellent overall quality. Educa — Good overall quality, but they have many similarly shaped pieces, making puzzles with large areas of the same color or pattern a challenge. Castorland – Pieces feel a bit thin and some of their puzzles (like the 1500 pieces) have very small pieces. But the 1000 piece puzzles have decent quality. Haven’t tried the larger sizes. Trefl — Pieces are a bit on the small side and grid cut is very standard. Pieces have a good thickness and density. They specialize mainly in photographic landscapes and collages, with only a few offerings that are illustrated. New York Puzzle Company — Nice boxes, thick pieces, and a creative non-grid cut. However, the looseness of the fit and high visibility of the piece cut when the puzzle is assembled is less than desirable. They have some great images that are worth these slight annoyances. MasterPieces — Quality too variable. Some puzzles have thinner pieces than desirable. Good boxes and images. Non-grid cut. Ceaco — Pieces simply too thin. Warped out of box, some image lift, tons of puzzle dust. D-Toys (editions with only two piece shapes) — Pieces are too thin and easily warped or bent. Most D-Toys puzzles have better quality and six piece shapes.Look for “wide variety of shapes” sticker for better quality. King — Pieces are too thin and too similar in shape. Pieces appear to fit where they do not. 1. BOX — How deluxe does the box looks and feel? Is it sturdy? Will it hold up over time? How nicely does it arrange on the shelf? 2. INSIDE THE BOX — How deluxe are the internal goodies (such as posters or brochures)? When you remove the pieces is there puzzle dust, pieces stuck together, hanging chads, and places where the image has begun to separate from the backs? 3. PIECE THICKNESS — How thick are the pieces compared to other brands? How does a piece feel in your hand? How easily are pieces damaged or bent during assembly and separation? 4. PIECE SIZE & SHAPE — Are the pieces standard shapes? Special shapes? How much variety do they have? Are they large or small? 5. PIECE FIT— Do pieces interlock well? Can it be confusing if a piece fits or not? Can you move groups of pieces together? Does it look snug when it’s done? 6. IMAGE REPRODUCTION — Are the colors bright and vivid? Is the image sharp or feel like a bad Xerox? How is the finish/texture on the pieces? 7. IMAGE VARIETY & ARTISTS — Does the brand have a wide variety of fun images and good artists? See our detail pages for photos and detailed info on each brand. I think you’re being too hard on ceaco. They have some of the most interesting images of them all. And their piece shapes are much more interesting than the brands that got your top rating. I won’t buy any puzzle that has boring piece shapes…like a lot of the European brands. But…that’s what I focus on…image and piece shape. So saying….the overall quality of Ceaco has gone down in recent years. I particularly liked the cork backed puzzles with custom shaped pieces and non-straight edges. But that haven’t made those for quite a while now. I very much enjoy your reviews. Thanks. Thanks for adding your point of view. Piece thinness is a real deal killer for me, and the puzzle I tried from Ceaco was way too thin and had pieces already bent right out of the box. But granted, it’s possible that was a bad one-off. I do like some of their images but I’m finding that good puzzle images tend to recycle around the industry and eventually someone other manufacturer will put it out. Still, if it works for you then buy it and be happy! That’s all the matters in the end. If you like the less standard shape of Caeco pieces, you’ll also like Springbok, Bits and Pieces, Sunsout, Master Pieces, and House of Puzzles. I like thicker puzzle pieces since I have arthritis in my fingers and some of the thinner ones are difficult if not impossible to handle. Where would you put Piatnik in that list above ? Hi, Michael — Yeah, I should do a page for Paitnik. Like you, I like their Ruyer cartoon puzzles. I agree with your instinct. The quality is not as good as Ravensburger, Heye, or Gibson. Their pieces are a bit thinner and the fit feels a little loose to me. But they have nice boxes and generally, the quality is quite acceptable. The pieces are not so thin that it’s bothersome. I also like their Christmas cartoon puzzles. 🙂 They’re probably around Educa in terms of quality numbers. Where is Dawdle Hill Folk Art puzzles in your comparison? What is their quality like? I haven’t evaluated Dowdle puzzles yet. I do have a few though it’s not generally my favorite art style. I will put it on the list to review. I would very much appreciate a review on Dowdle puzzles…I love the folk art style. Also, what about the US brand, “Mega Puzzles”? Dowdle Folk Art puzzles are very high quality. I did the Yosemite 500 pc and the San Francisco 1000 pc. The packaging is the most deluxe I have seen – a very sturdy glossy coated box with hidden magnetic closure. I need to REVISE my comment…I got recently got another Dowdle puzzle – Lake Tahoe – and am very disappointed in the quality. Unlike the other two I did, the fit of the pieces is sloppy to the point where you can’t tell if a piece really fits, rough edges on pieces and pieces in the package that were not separated. This must be from a different manufacturer than the others I did because the quality is way different, and nowhere near the quality of, for example, a Ravensbuger puzzle. Thanks! I have a Halloween one that I have not started and was curious what their quality is like. Are you familiar with Ensky, part of the Amada group from Japan? My sons enjoy anime, but I dislike poorly made puzzles, especially ones with thin pieces that are frustrating to put together. Thank you for your insightful and informative reviews. No, I’m not familiar with Ensky. Are you saying they are poorly made or the opposite? I notice Eurographics market an ‘MO’ puzzle. Can anyone tell me what ‘MO’ stands for? The containing box is evidently a different shape but is that all it is? – many thanks. I am totally psyched to see a blog about jigsaw puzzle brands. My husband and I have done about 93 puzzles since retiring 5 years ago. I have some favorites and some not so much. Keep up the good work! You only take TWO points off if a puzzle is missing pieces? Having a good box is nice, and having brochures in the box is also nice, but if I do a 1000 piece puzzle, and there’s a piece missing at the end, that’s almost unforgivable. So frustrating. And that’s only a two point penalty? I love the work you put in and the thoroughness of the reviews – I suggest re-evaluating that one penalty. Would you please consider reviewing Ricordi? I find them extremely frustrating puzzles. Hi there. I’m so happy that someone has taken the time to review all these brands. Thank you so much for doing it! I was looking at your chart and I noticed you have the Educa brand on it twice with the same final total (56), but different numbers in the categories. Was this a mistake or intentional? Hello and thank you for taking the time to do all of this! I am trying to decide which School of Athens puzzle to purchase off Amazon — Eurographics, Clementoni and Tomax all offer one. The Amazon reviews are (uncharacteristically) not that helpful. One reviewer did say that the Clementoni puzzle cuts off a lot of the original painting, another that the Eurographics image was fuzzy. I know it’s a lot to cover in a 1000 piece puzzle. Not sure how I’ll proceed but your high marks for Clementoni are very helpful. Anyhow, I am very happy to see there are others out there who take puzzles so seriously! I’m interested in a puzzle carrying the ‘GUILD’ name – could anyone comment on quality? I like the Waddington’s Christmas puzzles and have them all. The quality is good. Not as good as Ravensburger or Gibson, but quite decent. Do you know anything about the Re-Marks brand of puzzle? No, Kathleen, I haven’t heard of them. I just started a Tomax puzzle and I HATE it- If I tai two random pieces, there’s about 50% chance that they will match. They have just two basic forms, and it’s really enjoying and frustrating. Thanks for the info on Tomax! I had the same experience with Tomax. I will NEVER buy another one. I attempted a larger Tomax puzzle last year (2000 piece HallStatt, Austria, in winter) but gave up after struggling with it off an on for nearly 10 months. The picture on the box was great, but the colors on the puzzle itself were a bit muddy and not-at-all bright. The picture itself appeared to be fuzzy or out-of-focus. But the worst part by far was the puzzle pieces; there were many times when I thought I had a small section of the puzzle completed (where all the pieces had a similar unique color) but I was left with one piece that did not fit in the only remaining hole in that section. I then has to check each piece in that section to find out where I had mistakenly placed the piece that was supposed to fit in the one remaining hole. So puzzle piece variety is a big problem. I was attempting to piece the large section of sky together but just gave up. The big section of mountainside I never really attempted. There were also other negatives, but those listed above were more than enough for me to avoid any additional Tomax puzzle purchases. And thinking about it, I can’t really come up with anything positive about this puzzle. Hi, Richard. Thanks so much for the detailed info. Sounds like I want to avoid the brand! Does anybody knows anything about SPEZET or Nathan puzzle brands ? I haven’t done either of those brands. If you try one, let us know how you like it. Have you tried “Lang” puzzles? No, I haven’t tried Lang. We got an Aquarius puzzle for Christmas. Have you heard of this brand or any feedback on this brand? I just finished an Aquarius called Dream Combo (Yes, it is drug related, but I liked the complexity of the images more than content). The box is pretty sturdy, and pieces are roughly grid cut. Sometimes when moving images around the pieces loosen up, but once I completed the puzzle and sealed it with Mod Podge it really looks great and does hold well. 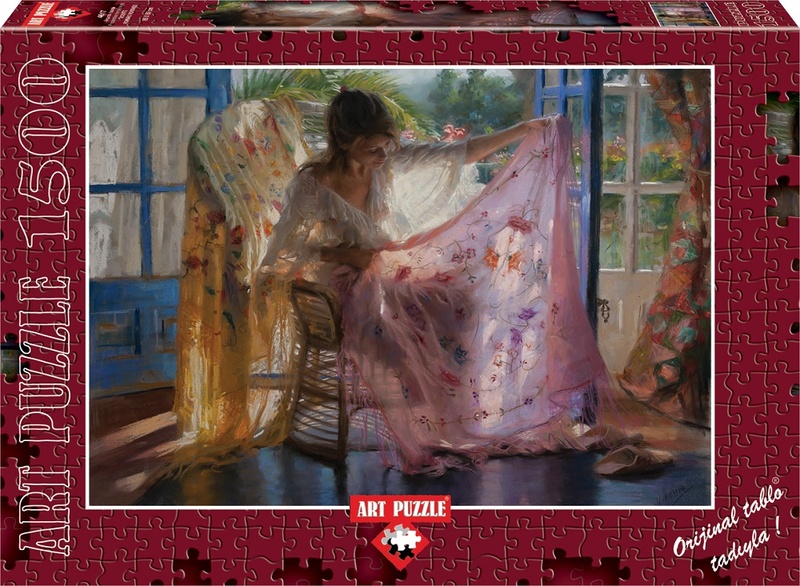 I appreciated the vibrant colors and variation of images across the puzzle making piece placement pretty easy. As I borrowed it from a friend, I expected some pieces might be missing, but none were. My only qualm is that the box image doesn’t show the outer 1″ or so of the puzzle, so good luck on the edges. Glad to see you are going to review Holdson. Serious Puzzles has started to carry a lot by this manufacturer. Hi, Kathleen. Thanks for the nudge. I’m working on a New York Puzzle Company brand comparison right now, but will put Holdson next on the list. Hi, your reviews are very helpful. I’m now considering to explore other brands aside from Ravensburger and Clementoni, which I’ve been exclusive to for some time. Looking forward to your reviews on the new brands. Hi, Bernadette. Good to hear! There are a lot of great puzzles out there. 🙂 Please let us know if you find something you like (or hate, for that matter). There is another brand, Pintoo, specializes in plastic 2d and 3d jigsaw puzzles. Can you do a review for their puzzles? Hi, Dennis. I’ll look into contacting Pintoo and see if they’ll send me a puzzle for review. We are doing a Holdson puzzle right now. So far, I am not too happy with it. Pieces are quite loose and can fit in various places. There is very little dust which is good. Also, the image is lovely! I doubt if I would purchase another of this brand since I prefer a tighter fit and the ability to move sections intact without them falling apart. Thanks for the info on Holdson, Kathleen. Can anyone point me in the right direction? Several days ago, I stumbled across a specific line of puzzles from a brand I can’t recall the name of now. It referred to a bright line. I can’t remember if it was “brilliant” or “luminous” or what, now, but it was something along those lines, for, as far as I could tell, 500 and 1000 piece puzzles. Selected images that were labeled this way to signal being extra, well, brilliant, I guess. (But note that these weren’t glow in the dark or truly shiny puzzles, like, say, Kinkade metallics). Just finished my first puzzle by New York Puzzle Company. A real treat, best I have done in a long, long time. Very off grid style, pieces irregular in both size and shape. Occasionally a question of does this fit?, but not enough to frustrate or annoy, IMO. When completed, I could pick up the entire 1000 piece puzzle in one sheet, therefore tight fitting on this cut. Name of the puzzle is Good Housekeeping Collection, but no mention on the box to the artist’s name on all of the collage images. In actuality it is Coles Phillips with his popular Fadeaway Girls, the primary reason I purchased this one as I love his artwork. Most of the cover images did show the artist name, but perhaps the puzzle company did not notice, or feel it necessary to publish it. Yes, this puzzle did have dust, the only thing I can fault it on regarding quality. I will definitely purchase more from this company, and try to post if the quality differs on other titles. Happy to have found this site. For years I have stuck to several familiar companies because I was afraid of getting a grid puzzle, which I find boring in the ones I have gotten stuck with because of the similarity of the pieces. Maybe these reviews will help me to get outside the box. Hi, Susan. Thanks for your comments on Good Housekeeping Collection by New York Puzzle Company. Sounds like a good one! And welcome to the blog. Hope you find some puzzles to try here. Does anyone happen to know what I’m referring to here? A few weeks ago I came across some puzzles at a B&N store that had some label like “bright” on them, or “brilliant” or something synonymous with it. I can’t remember the brand name now of the puzzle line. But evidently they have a line of puzzles that are marketed as being especially brilliant? I do remember seeing some puzzles from this line on their website. But now, for the life of me I can’t remember which brand it was, and I can’t find it. I used this website as a jumping off point to search the various brand websites, but to no avail. Please tell me this rings a bell for someone, anyone. (Note: One thing I am definitely NOT talking about are the Thomas Kinkade metallics). I was wondering if you could do a review on the puzzle brand “Grow” they are famously known for their Romero Britto’s art work puzzles. I’ve been wanting to buy some online but I am a bit afraid that the puzzle quality might be bad. Hi, J. I have seen MB puzzles but never done one. My impression is they are a bargain brand available in grocery stores, etc. But maybe one of my readers can give first hand experiences. I don’t believe they are made any longer. Has anyone ever purchased the Sarang brand from Korea? I am wondering about the quality of the graphics and the level of difficulty. Hi, Cathie. I haven’t, but maybe one of our readers can help. Oh, so glad I found this site. Love having the comparison. I just returned a Springbok puzzle. The edges were all ragged and the pieces did not “snap” together, they just kind of mushed together. Terrible quality. Buffalo and Pomegranate are my favs. Hi, Lisa. I haven’t had that problem with Springbok, so maybe you got a bad one. Sometimes if a puzzle is at the very end of a print run, the die cut blades get blunt, and the puzzle can not be as clean cut or nice. I do really like Buffalo and Pomegranate too. Hey thanks so much for all this info ! Hi, Justyna. Glad you found the site! Be sure to look for Schmidt Premium Quality, which is just a few years old. They have some quite nice fantasy puzzles. Hope to see you around the site. Where do you buy your Schmidt puzzles. I find them hard to get a hold of in US. Hi, Julie. Puzzle Warehouse has a pretty good selection of them right now. Wow! Thanks for the mention of the Schmidt brand. Never looked at it; can’t wait to order some of the luscious color-filled images. I want to say that I am thoroughly enjoying your emails and this blog. I’m learning a lot (lifetime jigsaw lover) and enjoying the introduction to many brands. However, once I’ve worked a Pomegranate, it’s tough to judge other brands fairly. To me, no other brand can compare in any and every category. Hi Shannon. Lovely to hear from you. I’m glad you enjoy the blog. Pomegranate is a beautifully-made brand for sure. I always enjoy them. I’m personally attracted to so many images besides the fine art, though, that I don’t do them as often as I’d like. 🙂 Hope you like the Schmidt! Just wanted to say again how glad I am I found you and how brilliant your site is. You like a lot of the same puzzles I do so it’s great to read your reviews and then I can almost` try before I buy’!! Now if you could maybe wave a magic wand and get someone to send more of the US puzzles and images over to Scotland I would be mega happy (and probably mega poor too!). Unless anyone knows of a cheapish way of importing puzzles from the US as usually it costs almost double the price of 1 puzzle to get them here. Thanks again Jane. It’s the same for us over here trying to get Euro/UK/Scottish puzzles. House of Puzzles is one brand that I love that’s hard to get in the US. My best suggestion is to find a distributor with a flat rate shipping charge and order a bunch at once to minimize the shipper per puzzle. You can try Puzzle Warehouse for US puzzles (http://www.puzzlewarehouse.com/shipping/). They ship internationally but I’m not sure of their exact charges to Scotland. Good luck! I hope you will someday review Galison, which I think makes some incredible puzzles, Re-Marks and Hennessy Puzzles. Hi, Julie. I’ll add them to my wish list. Thanks for the sugggestion. I’m back with a few more comments and questions. I am working my first EDUCA brand and am pleased with the quality of the image and pieces. On the other had, I just received my first 1500 pc puzzle which is a MEGA brand. I loved the image and tried to research the quality on this brand finding zero available. I asked the seller about the quality of the image to no avail–box was sealed. Upon inspection I can see the image on the pieces is bright and shiny but the pieces are soooo thin I’m discouraged. Has anyone worked this MEGA brand and is it worth the struggle for a good image. I am done with Ceaco (did 3). Like there images but again…pieces are to thin. I’m trying to find a 1000-1500 pc Ravensburger that I’d be excited to assemble but so far nada. All input welcomed. I’m a newbie at selecting the best all around brands. I have not reviewed Mega on Jigsaw Junkies. One sign of quality you can check for if you can’t find information on a brand is price. Brands that are going for the bargain brand tier are likely to have quite thin pieces, and are in the $9.99-12.99 range for 1000 pieces. Some people want this price point and don’t care much about the quality as they usually do a puzzle once and pass it along or throw it away. So often that price will indicate what you can expect. As for what other brands you can try, on our brand comparison page, just under the chart at the top, there’s a list of “High Quality Brands” or “A Brands”. You can try any of those and be pretty confident about the quality you’ll get. Thanks for your reply on the Mega Deluxe brand. I figured as much because of the lack of information reviews. I am following your top brands very seriously. My problem was being a sucker for the image which I loved. I will give it a shot to see if the pieces hold together enuf to lift them in groups without swearing. I can say I am enjoying this journey with you. I find puzzles a wonderful outlet for stress. I know what you mean about falling for an image. Please let us know what you think of Mega, Catherine. The Mega Deluxe brand was simply awful. When I opened the box I could tell that the pieces were very thin…thinner than Ceaco which is an ugh for me. I notified the seller (ebay) immediately letting her know she should be aware of the poor quality of that brand. Said I was throwing it in the garbage–not worth the struggle. She issued me a complete refund even with me not asking. Lesson learn. Quality in more important than image. Thanks for letting us know about Mega. I agree. Quality is very important. I just ordered 1500pc Ravensburger Vintage Paris and 1000pc Bizarre Books. I’m sick of buying cheapo puzzles…not worth the effort. You were right….I just had to KEEP LOOKING until I found something I wanted to assemble. That keeps your interest if the road gets rough. So I’m starting with the BEST so I know the difference. Thanks a bunch. Newbie in Milwaukee. Hi, Jacqui. No I haven’t tried a Grafika before, but I found a bunch of cool gothic Chris Ortega’s by Grafika when I Googled. If you try the brand, please let us know what you think! I love gothic images. I was unsure which brand I should purchase as I was torn between three brands – Ravensburger, Schmidt Premium and Eurographics. Although I ended up ordering all three, there was a noticeable difference between the Schmidt Premium and the Ravensburger one (the Schmidt one:https://www.amazon.co.uk/Schmidt-Emoticons-Premium-Quality-1000-Piece/dp/B0133QPADO and the Ravensburger: https://www.amazon.co.uk/Ravensburger-Arctic-Wolves-1000-Pieces/dp/B00DF06WK4) The Ravensburger one fitted together well, but I found that I was much more sure that I had put the pieces in the right place on the Schmidt puzzle despite the difficulty. Thanks for the report! Good info. I noticed you don’t have too many Asian brands up. I recently purchased a Tenyo puzzle from Japan, have you ever tried one? I’m quite liking it so far and their images are my type which is cutesy cartoony stuff. So I am looking to do a custom photo puzzle for my wife who is an avid puzzler for Christmas. I see that Ravensburger does that. Does the quality of their mass produced puzzles show up on custom ones that you know of? Is there another brand that you would recommend our are they the best? Hello! I don’t know. I’ve seen those Ravensburger custom photo puzzles, but I never tried one. Perhaps another reader can chime in. However, they’re generally a very good quality company so that’s who I would go with if I were wanting a customer photo puzzle. I’m delighted to have found this site what a wonderful resource to us online purchasers! I’m very much looking forward to seeing a review on the Grafika range but meantime you have given me plenty of food for thought as to which other brands to try that hitherto I’ve been wary of! I’m from the UK and therefore have easy access to HOP. I’ve a few lined up as the shop in the village where I lived in mid Wales stocked them. I used to wonder why a shop and cafe catering mainly for tourists (a lot of whom were from the States) also had such a large supply of these puzzles …. well now I know!! I’m not sure if Gibson are still making them but I found that their 630 piece panoramic puzzles were not such good quality as the others. I agree about King although I believe some are better quality than others I’d never actually buy one again. Having said that they did once produce some very reasonably priced wooden ones which were lovely although not up to the standard of say Wentworth. the one I bought was a real pleasure to complete and I wish I’d bought more at the time! Hi Linda, I sent this review of Grafika to Jane but realised I hadn’t posted it so here goes. I actually contacted the company I bought them from in advance to ask about the quality compared to Ravensburger and the person who responded said that they were the same – mmm, not true, but I don’t think there was any intent to deceive. I have to say I thought the box was quite nice, although nothing in it apart from the bag of pieces but at least it has the puzzle title and the name of the artist on one side. I started with one of the gloss finish puzzles called `Night Unseen’ – and boy are they glossy! (they offer matt and gloss). The first thing I would say is there was absolutely no dust in the bag at all! The pieces are a little thin but on the plus side they don’t `ride’ when you move a group of them which is good. There were a few pieces still attached but were easy to pull apart without tearing the card and none of the pieces had image lift or tearing on the underside. On the down side while the pieces fit well the fit is very loose and you couldn’t even pick up 2 without them coming apart – which is very disappointing. In terms of image quality, I’m not sure if it is the gloss finish but I didn’t think it was very sharp – almost like `soft focus’ (again this is not how they were described to me – although maybe the matt finish is better), certainly not a direct copy of the image on the box in terms of colour saturation. In saying that though there was a lot of blue/grey in this particular image which I thought would make it tricky but actually it wasn’t too bad. It also helps that some of the piece holes are not the standard shape so if all else fails you can search for a piece that will match! Thanks so much for that report on Grafika. I love those Cris Ortega puzzles too. It’s nice to hear a report on the quality. I was interested in them because of the choice of pictures and hoped they’d be good enough quality to make them a pleasure to do. I didn’t know that they did glossy and matt it wasn’t mentioned on the sales site I found them on (A German one Jigsaw and More) I much prefer a matt finish but can live with a glossy one if needs must! I remember the first time I did a Ravensburger puzzle and sang their praises to my German collegue …… who’s first reaction was to tell me I was pronouncing it incorrectly! (I was pronouncing it ‘Raven’ as in the bird! Well that was me told!!) I wish other makers would take as much trouble with quality as they do. Your review has made me decide to give Graffika a try as the thing I dislike most is thin pieces! That they don’t fit so well as hoped is something I can live with after all HOP with their wavy peices can be a pain to move around! The mountains in Sunsout’s Penguin Place puzzle and White Mountain’s Penguin Plunge are non-coincidentally similar.Who’s copying whom? Hi, Eunice. Art is often licensed for puzzles, so multiple puzzle companies may use the same image. Unless the company has paid or negotiated for “exclusivity”, or hired the artist to do the image just for them, it’s up for grabs to anyone who wants to pay the licensing fee. In the case you mentioned, the art in those two puzzles is actually identical and is by artist Michael Searle. So both companies paid to license the image. Thanks for adding your comments. The image can make a big difference, also the year it was produced and where it was in the run (puzzles at the start of the run tend to be tighter). But we do our best to represent the brand based on the few things we sample. Hi, Jigsaw Junkie 🙂 You’ve made a really good and useful comparison of most of the popular puzzle brands. Thanks! I’ve found hardly any info about this brand, but it seems to be Turkish… Have you ever heart about it and what do you think about such a “risky” buy of “unknown” brands? Hi, Sara. I’m glad you find the brand comparison useful! That’s a pretty image. Educa also has released a puzzle of it. As for buying brands that I don’t cover, here are my thoughts. First, look for reviews online on store sites. If they look positive, or you can’t find any reviews, decide if you like the image enough to take the chance. Most puzzles are pretty cheap in the overall scheme of things. I will definitely take a chance on an unknown brand if I love the image and don’t see a lot of negative reviews. Just one at least. If you don’t like the puzzle, you can decide not to buy that brand again. And let us know! I love to see comments from puzzlers on brands we haven’t reviewed. One more tip: price point can tell you a lot too. Bargain brands are generally under $12 for a 1000 piece puzzle. If you are happy with bargain brands quality, that’s cool, but if you want thicker pieces, nice boxes, etc., then you might steer clear of brands in that price range. I am hugely disappointed with a 2000-piece jigsaw puzzle made by Andrews+Blaine. The artwork is Charles Fazzino’s stunning “In a New York State of Mind”. The density of the cardboard is adequate. But the quality of the cutting is horrendous. Many of the pieces have lost their tabs and legs right out of the box. I have a collection of orphaned pieces that I haven’t been able to match up yet. I am awaiting the promised replacement. Mega Brands – Now doing a Garden Delight series from this brand and loving it. Varied puzzle shapes include some birds, butterflies, flowers; they fit together really well (you can pick up a section and move it without it all falling apart), It’s clear when pieces fit together (really important to me, I am bored by puzzles where all pieces are the same kind of shape and you can’t tell which ones fit). The puzzle was used, yet it’s in perfect condition, so the pieces aren’t flimsy.